Are you overweight? Do you carry a few extra pounds? Is your craving for sweets a big part of the reason? If so, you’re not alone, and Erin Huggins, the author of Sugar Cravings Smackdown, says that sweets were her Achilles’ Heel. She could take the time and make the effort to eat all the “right foods” and even in proper proportions. But she couldn’t resist anything sweet, and she would often find herself binging on whatever sweet foods she could find. This, of course, led to her being out of shape and overweight. Erin eventually discovered a way to lose the weight and overcome the cravings, though she says she still eats enough sweets to keep her satisfied. She wrote of her experiences in Sugar Cravings Smackdown, a course and diet plan that she says can help you learn to overcome your weakness for anything with sugar in it. Is Sugar Cravings Smackdown a scam, or is it a solid plan? Click here to visit the Sugar Cravings Smackdown Website. Read on for the full Sugar Cravings Smackdown review. If you like bonuses, you’ll like Sugar Cravings Smackdown, as Erin gives you a lot of reading for your money. 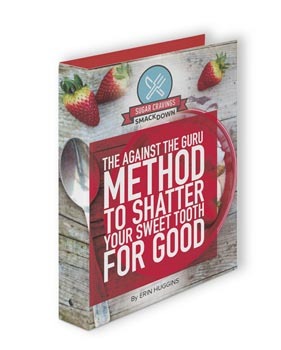 The basic Sugar Cravings Smackdown book is a 48 page PDF book that is quite impressive in appearance. Most books I’ve seen in the weight loss niche look like Microsoft Word documents that were converted to PDF format. 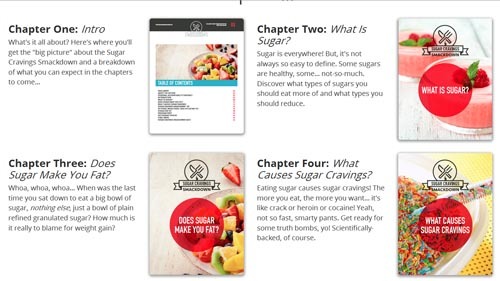 That’s not the case with Sugar Cravings Smackdown; this is a professionally prepared, slick looking ebook that, if printed, might resemble a magazine. All of the pages and photos are full color, and the graphics are quite impressive. The Sugar Cravings Smackdown begins with a “Personal Accountability Contract” that Erin asks you to sign. This basically confirms that you’re willing to put in the effort to follow the plan. She feels that if you sign a document that reaffirms your commitment, then you’ll be more likely to follow through and you will therefore be more likely to see success from the program. 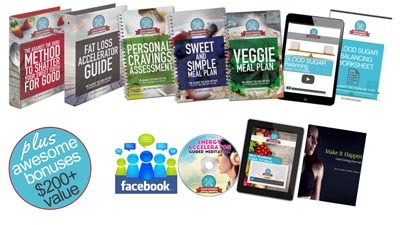 The main book works well with the Sweet and Simple Meal Plan bonus, as the first book gives you the overall plan and the second book gives you the recipes to help put that plan into action. The basic Sugar Cravings Smackdown plan consists of three different phases, each of which is designed to help refocus your attention on what you should be eating. Phase one of Sugar Cravings Smackdown is about making sure that you eat on a regular schedule. It’s important that your body get in the habit of eating regular amounts at regular intervals. Phase two introduces a bit of sweets each day, while making sure that you’re getting proper nutrition from everything else you eat. Phase three gives you a final ratio of sweet foods to non-sweet foods that you can eat, day in and day out. The three phases are introduced over a period of three weeks to allow you to acclimate yourself to the new diet. This is an oversimplification, of course, as the Sugar Cravings Smackdown goes into extensive detail about the role of sugar in your diet and why it’s not at all bad to eat some sweets. The key, of course, is to establish an eating plan that allows you to eat an appropriate amount of sweets while not going overboard about it. As with all responsible diet plans, Sugar Cravings Smackdown emphasizes that you should eat lots of fruits and vegetables and that you should be sure to drink lots of water each day. A moderate amount of exercise is also recommended, though the Sugar Cravings Smackdown doesn’t really emphasize a specific workout regimen. The Sweet and Simple Meal Plan book is as described; a book that offers a number of recipes for breakfast, lunch, dinner and side dishes. The recipes use common ingredients, are easy to follow and appear as though the finished meal will be quite tasty. You’ll find that the Sugar Cravings Smackdown gives you a surprising amount of latitude regarding what you eat. Erin simply helps you rethink how you go about eating so that you’ll make healthier choices. I’ve read a lot of books on diet and weight loss and I don’t think I’ve ever seen one that was as attractive and well-presented as Sugar Cravings Smackdown. The book is concise and manages to describe the diet plan in a relatively small number of pages, so you aren’t likely to get bored with it. You have plenty of choices regarding what you eat, and you’ll be able to eat quite a few sweet items each day. The recipes look great and easy to prepare. If you find yourself unable to resist sweets of any kind and you want to cut back and lose some weight, Sugar Cravings Smackdown is probably a good choice for you. Sugar Cravings Smackdown is recommended.